Rheumatoid Arthritis (RA) is a chronic inflammatory disease characterised by progressive, symmetric joint inflammation and subsequent deformity. If left untreated, RA is associated with significant patient morbidity and accelerated mortality. The disease affect females four times more frequently than males in 4:1 proportion, and the reported prevalence of RA varies from 0.5% to 3.8%. Subsequent destruction of articular cartilages leads to joint stiffness and limited mobility affects daily household activity. Homoeopathic system of medicine aims at improving the general well being of the individual (i.e., quality of life; QoL) in addition to reducing the pain and disability, which fulfils the criteria of improvement laid by American College of Rheumatology (ACR). A controlled clinical trials conducted for this degenerative disease in the field of Homoeopathy examined the enhanced response of those on conventional therapy with homoeopathic medicines over those on conventional medicine with placebo. This measure valued the therapy in the management of patients with RA. Randomised control trial of homoeopathy in RA conducted by Fisher and Scott identified significant pain relief with placebo than homoeopathic medicine. The study suggested that active homoeopathic medicines does not improve the symptoms of RA patients who are stabilised with NSAIDs/DMARDs. These results could be the effect of blinding. Similarly a randomised clinical trial regarded the clinical benefit of homoeopathic intervention in RA attributable to the consultation process and not the therapy itself. The present paper examines the clinical assessment including QoL of the patient with homoeopathic constitutional similimum (selected on the basis of mental generals, physical generals and particular symptoms). 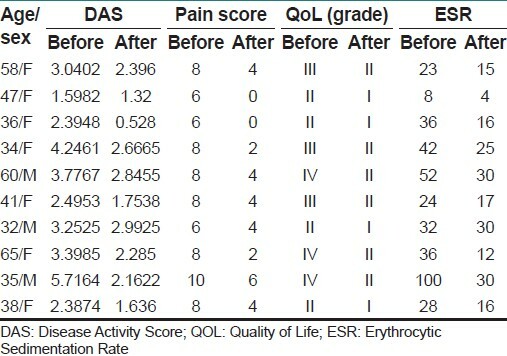 In this study, the patients with RA receiving homoeopathic medicine were analysed for QoL, disease activity score (DAS), erythrocyte sedimentation rate (ESR), morning stiffness/pain and frequency of analgesics as outcome measures. The present study was conducted at private homoeopathic OPD located at Upnagar, Nashik, Maharashtra, India. The data of ten patients under homoeopathic treatment for more than three months, over a period between February 2009 and February 2011, were retrospectively analysed to investigate the efficacy of homoeopathic medicines in patients with RA. Ten cases of RA (age 32-60 years) under homoeopathic treatment were evaluated from the single private homoeopathic out-patient clinic. Those under the homoeopathic treatment for a period of more than 3 months, between February 2009 and February 2011, were analysed. These were diagnosed cases of RA and confirmed clinically by presence of at least four clinical signs or symptoms as swelling of two or more joints, morning stiffness lasting for more than 1 hour for at least 6 weeks, symmetric arthritis, that is simultaneous involvement of same joint area on both sides of body, presence of rheumatoid nodule over bony prominences/extensor surface or juxtra articular region. These patients were not satisfied with conventional treatment. These cases were analysed to find out the role of homoeopathic constitutional similimum in people with destructive joint disease, that is RA. Patients receiving NSAIDs, DMARDs or anti-TNFα were also analysed after homoeopathic medicines, as to check frequency of the use of such drugs when the patient is receiving homoeopathic medicines as a complementary therapy [Table 1]. Patients tested sero-positive for RA, patients who took homeopathic medicine for 3 months or more were included in the study. The homoeopathic medicines were selected as per the law of similia and prescribed singly at one occasion. The analysis was done as per Kentian school of philosophy, that is mental general, physical general and characteristic particular. Detailed case taking, its recording and interpretation of the symptoms were the steps followed for repertorisation. The symptoms were classified and evaluated to erect the totality. The repertorial results were analysed and importance given to the essence of the patient considering life space situation, predominant mental/emotional state (diagnosis of the person as a whole) for final selection of medicine. Placebo was continued with improvement in general condition of the patient. The selection of acute medicine was based on acute totality. In cases where medicine was changed Gibson-Miller remedy relationship was followed. The potency and repetition of medicine was decided by individual susceptibility. Synthesis repertory (Version 09) was used for repertorisation using RADAR 10 software. Consultations were planned at one month of interval or early if needed and recorded with standardised detail with respect to clinical history, current symptoms, mental/emotional states and medication. Individualised homoeopathic prescription was given in pills. The potency of the medicine during subsequent consultations was raised based on the progress of the case or the medicine was changed in cases where no change in the symptoms observed following Gibson-Miller remedy relationship. 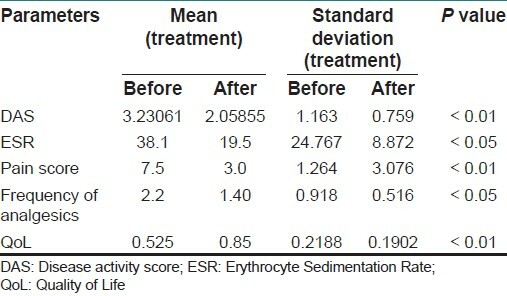 ESR tested at 3 months of duration. Each individual patient was assessed for DAS set by ACR. Joint count is one of the components to measure DAS and includes swelling, tenderness, pain on motion, limited motion and deformity. The other components to measure DAS are ESR and patient's global assessment on visual analogue scale (VAS). Pain/morning stiffness was measured on VAS rated from 0 to 10. In addition to DAS, morning stiffness and QoL were also considered as outcome measures [Table 2]. QoL measured as Grade I (no handicap, can carry daily activities) Grade II (moderate restrictions of activities but independent), Grade III (marked restriction of activities mostly limited to self care, needs assistance) and Grade IV (bed/chair bound, incapacitated and dependant). The grading was done according to Steinbroker's classification (modified). +2 variation in pain score on VAS, reduction of ESR towards normal value, changes in QoL to the subsequent lower side, improvement in DAS to Grade I and reduction in the consumption of analgesics and NSAIDs to SOS were considered as baseline parameter for improvement. The results are the comparison of components in the variable before and after the treatment modality using paired tail t-test. 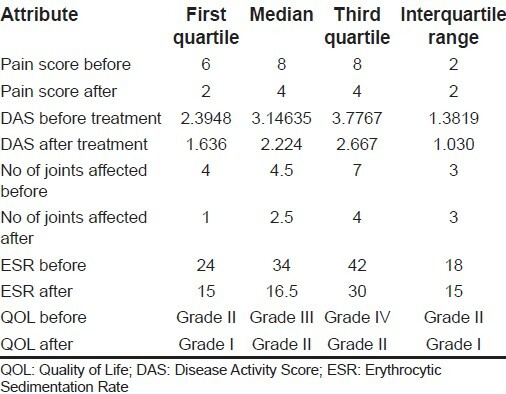 Pain score, DAS and QoL were analysed on 0.01 level of significance. DAS calculated as 0.5 √ Tender 44 + 0.06 √ Swollen 66 + 0.33 (ESR) +0.007 (Global health on VAS). DAS is classified >3.6 as high disease activity, between 2.4 and 3.6 as moderate disease activity, between 1.6 and 2.4 as low disease activity and below 1.6 as experiencing remissions. ESR and frequency of use of analgesics were analysed at the confidence level of significance of 0.05. Non-parametric test-Spearman's rank correlation-was employed to find out the correlation between each variable before and after homoeopathic medication [Table 3]. 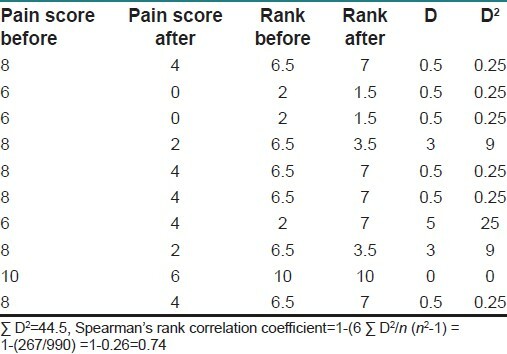 As Spearman's correlation coefficient is close to 1, it proves that there is positive correlation in decrease in pain score, due to the homeopathic treatment, which proves that the treatment worked successfully [Table 4]. In the present trial, seven females and three males were found to have sero-positive RA. Homoeopathic similimum were found to reduce the intensity of pain in patients with RA. Mean pain score reduced to 3.0 from 7.5. (t = 4.3733, P < 0.01) along with reduction in consumption of NSAIDs and DMARDs. Five patients were taking analgesics daily, two patients were consuming analgesics at an interval of 3-5 days, whereas three patients were taking analgesics as SOS. After being treated with add-on homoeopathic medicines, six patients completely stopped analgesics and four continued to do so as SOS. One patient was treated with Methotrixate (mild immunosuppressant) 2.5 mg twice a day, who after being treated by homoeopathic medicine, reduced the said drug to once a day from second subsequent month then alternate day from third to fifth month and finally stopped at the end of fifth month. The mean frequency of analgesics fell from 2.2 to 1.4 and standard deviation (SD) from 0.918 to 0.516. (t = 2.4, P < 0.05). The disease activity reduced in all 10 patients. Mean DAS improved to 2.0585 from 3.23, and SD to 0.759 from 1.163 (t = 2.67, P < 0.01). The QoL was also found to improve under homoeopathic medication. Mean QoL improved from 0.525 to 0.85 (t = 4.044, P < 0.01) [Table 5] and no further deteriorations (joint disability) was observed in any of the 10 patients. Mean ESR improved to 19.5 from 38.1 (t = 2.235, P < 0.05). Three of ten (30%) patients tested sero-negative after homoeopathic constitutional similimum. RA, a destructive joint disease, affects the articular cartilages leading to limited movement at the affected joint or in advance cases causing deformity of the joint making the patient disabled and dependent. The diagnosis is made by the clinical signs and symptoms along with positive serological tests. Joint count is a major component of DAS. Joint tenderness, joint swelling and ESR are measures of inflammatory activity and are included in the core data set of measures of DAS for use in clinical research and control of inflammatory activity according to these measures is regarded as an effective strategy to prevent long-term damage. Joint score includes swelling, tenderness and pain on motion, limited motion and deformity. Holistic treatment of the disease involves relief of the symptoms of disease, that is pain, tenderness and limited mobility of joints, and also the improvement in the QoL to carry out daily activities independently. In this observational study, 10 diagnosed patients of RA (sero-positive) and receiving homoeopathic medicines were evaluated. Out of these 10 patients, 3 (30%) tested sero-negative after homoeopathic similimum. One patient improved with Pulsatilla, whereas the other two patients received Belladonna 30 and Aurum Met 30 (raised slowly to IM over a period of 2 years), respectively, and serum turned negative for rheumatoid factor, one was rated high for DAS and the other two with moderate DAS. Three of ten patients were found to have deformity of the most affected joints. Two patients had ulnar deviation of both the wrist joints, whereas the third patient had swan neck deformity at inter-phallengeal joints. 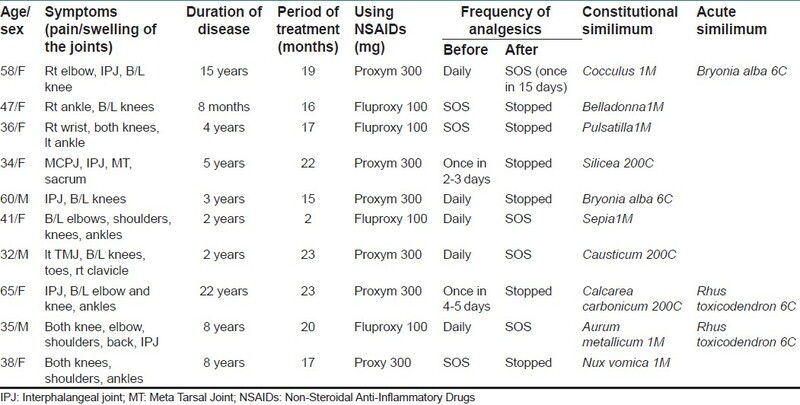 The pain score/joint count improved in all the 10 patients with reduction in consumption of NSAIDs. A minimum difference of 4 in pain scale was considered significant. ESR was performed at 3-4 months interval, which also showed reduced disease activity. After assessment, three patients were classified with high DAS, four with moderate DAS, two with low DAS and one with remissions. After homoeopathic constitutional similimum, three patients were classified with moderate DAS, four with low DAS and three with remissions. QoL also was found to improve under homoeopathic constitutional similimum. The change from one grade to another was considered as significant. Arsenic album, Belladonna, Calcarea carb, Lachesis, Pulsatilla, Causticum, Nux vomica, Silicea, Cocculus, Sulphur, Sepia, Aurum metallicum were used as constitutional similimum given singly at one occasion depending upon the totality of symptoms [Table 1]. The potency, dose and its repetition was done according to the individual susceptibility. Rhus tox and Bryonia alba were prescribed in cases where patient did not respond after administration of constitutional drug for next 2 days in acute phase. This prescription was made according to acute totality as SOS in 3 of 10 cases, 4 pills to be taken at 6 hours interval for 3-5 days. In cases where medicine was changed Gibson-Miller remedy relationship was followed. The totality of the symptoms was constructed considering mental generals, physical generals and particular symptoms of the patient and repertorisation done using Synthesis repertory (Version 09). The dose of NSAIDs/DMARDs was slowly reduced as per the improvement found in general and disease condition of the patient. Appetite, thirst, bowel habit and sleep were considered for improvement in general condition. Whereas intensity of pain on VAS, duration of morning stiffness and ESR were the parameters to evaluate the disease condition. Five patients were taking analgesics daily, two patients were consuming analgesics at an interval of 3-5 days, whereas three patients were taking analgesics as SOS. The analgesics were slowly tapered down to alternate day, followed by reducing it to SOS and then stopping it completely in patients who were consuming it daily. Whereas those who were consuming the analgesics at an interval of 3-5 days were suggested to take it as SOS followed by complete stoppage of the medicines. Those who were taking analgesics as SOS stopped it as there was improvement in the general condition. After being treated with add-on homoeopathic medicines, six patients completely stopped analgesics and four continued to do so as SOS. The patients are continuing homoeopathic medicines as required on account of pain caused by climactic variation or any other exciting cause. These acute exacerbations are managed with administration of constitutional similimum selected on the basis of mental general, physical general and particular symptoms or based on the acute totality as required. Though the deformity in three patients did not improve under the treatment, no further deterioration of the affected joint or the deformity of any new joint was reported. There were two distinct observations during the study. i) Patients revealed negative rheumatoid factor on laboratory investigations still complained of occasional arthralgia on weather change. ii) Where the serum is positive for rheumatoid factor but no or minimal physical symptoms are complained by the patients. These varied reactions to the immunogens during the treatment period with homoeopathic medication to the individual susceptibility and sensitivity, need to be further studied by considering large samples. The results of this observational study lead to investigate the efficacy of homoeopathic medicines in such degenerative disorders from controlled trials on large sample. Homoeopathic constitutional similimum improves the QoL of patients with RA by reducing intensity of pain, limiting disability and reduces the disease activity. Thus the improvement in general and disease condition limits the need of analgesics and DMARDs in RA. The present study is an observational one where patients diagnosed as having RA by sero-positivity along with presence of at least four clinical signs of RA, under homoeopathic medication were analysed. Similar research could be done with a greater sample size to investigate the role of homoeopathic medicines considering two different samples, namely sero-negative and sero-positive RA. The authors take pleasure to thank Prof. Gouri Patil for her contribution by statistical analysis of the data. The authors also show hearty gratitude to Prof. (Dr.) Kanjaksha Ghosh, Director, National Institute of Immunohaematology, King Edward Memorial Hospital, Parel, Mumbai for his guidance and revision of the paper. 1. Sainani GS. API Text book of Medicine. 6 th ed. Mumbai: Association of physicians of India. 2. Jadhav MP, Jadhav PM, Shelke P, Sharma Y, Nadkar M. Assessment of use of complementary alternative medicine and its impact on quality of life in the patients attending rheumatology clinic, in a tertiary care centre in India. Indian J Med Sci 2011;65:50-7. 3. Hennigan S, Kavanaugh A. Interleukin-6 inhibitor in the treatment of rheumatoid arthritis. Ther Clin Risk Manag 2008;4:767-75. 4. CIMS. Current Index of Medical Specialties. Vol. 22. Bio Gard Pvt Ltd; 1999. 5. Kavanaugh A. An overview of immunomodulatory intervention in rheumatoid arthritis. Drugs Today (Barc) 1999;35:276-86. 6. Gibson RG, Gibson SL, MacNeill AD, Buchanan WW. Homoeopathic therapy in rheumatoid arthritis: Evaluation by double-blind clinical therapeutic trial. Br J Clin Pharmacol 1980;9:453-9. 7. Fisher P, Scott DL. A randomized controlled trial of homoeopathy in rheumatoid arthritis. Rheumatology (Oxford) 2001;40:1052-5. 8. Brien S, Lachancee L, Prescott P, McDermott C and Lewith G, et al. Homoeopathy has clinical benefit in rheumatoid arthritis patients that are attributable to the consultation process but not the homoeopathic remedy; A randomized controlled clinical trial. Rheumatology 2011;50:1070-82. 9. Harrison Principles of Internal Medicine. 16 th ed. Mac Grow Hill Medical Publishing Division; 2005. 10. Miller G. Remedy relationship chart. Repertory of Homoeopathic Materia Medica. In: Kent JT, editor. 6 th ed. New Delhi: B. Jain publisher Pvt. Ltd.
11. Robert HA. Susceptibility. Ch. 17. The Principles and Art of Cure by Homoeopathy. New Delhi: Indian Books and Periodical Publishers. 12. van der Heijde DM, van 't Hof M, van Riel PL, van de Putte LB. Development of a disease activity score based on judgment in clinical practice by rheumatologists. J Rheumatol 1993;20:579-81. 13. Sokka T, Pincus T. Quantitative joint assessment in rheumatoid arthritis. Clin Exp Rheumatol 2005;23:S58-62.